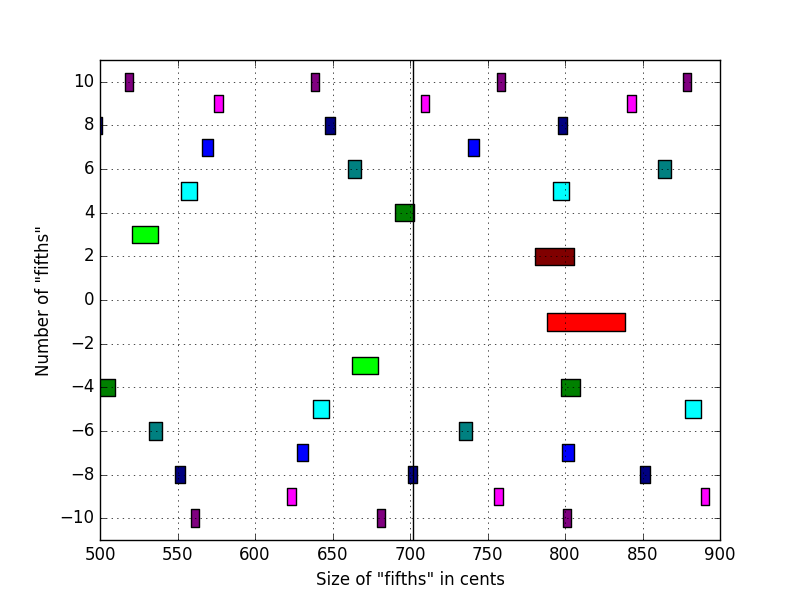 This shows as horizontal bars the range of “fifths” (or generators) for which n generators give an adequate major third. “Adequate” here means within 25 cents, and n is the number on the vertical axis; negative n means fifths downwards, positive n is fifths upwards. The black line is at 702 cents, a just perfect fifth. The bar colors just help distinguish different values of n (and make it a little less boring than if everything were blue). So you can see that for just fifths, four upward fifths or eight downward fifths will work. The range where four upward fifths will work is larger, but still only 12.5 cents wide. The just fifths line is very close to the upper edge of the band, and once you go beyond it in the positive direction, there’s a small gap before you get to the range where nine upward fifths give a major third. In the other direction, ten downward fifths work, but only after a somewhat larger gap where nothing smaller than eleven fifths will do it. It’s belatedly occurred to me this picture has 180° rotational symmetry around (600, 0). Four perfect fourths down is the same as four perfect fifths up, et cetera, which is why the 500 line crosses the -4 and 8 bars while the 700 line crosses the 4 and -8 bars.